"Centennial Bouquet with Border" tapestry shows a floral still life of flowers and leaves in an urn. A mustard colored background with a central floral bouquet is seen, with an ornate border of architectural details and leaves and an outer border of winding acanthus leaves. 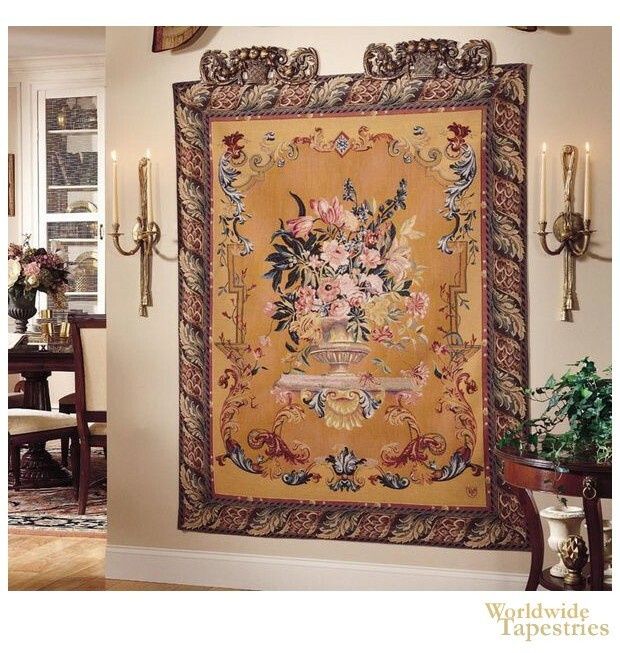 This floral tapestry "Centennial Bouquet with Border" is backed with a lining and has a tunnel for easy hanging. Note: tapestry accessories, where pictured, are not included in the price. Dimensions: W 53" x H 69"